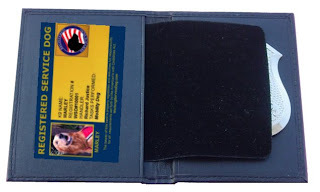 - Fully customized PVC Plastic Identification Card (the same material as your credit card). The card will include your dogs photo, your name, a Working Service Dog ID number and the tasks your service dog performs. Stating the tasks your service dog performs on your id card will answer the only question allowed to be asked of you. 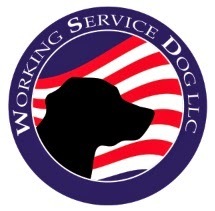 - Free submission into our Working Service Dog Registry Database. You will be issued a Working Service Dog Identification Number which will be printed on your ID Card. - Metal "Registered Service Dog Shield", shield is complete with a colored medical logo center seal. 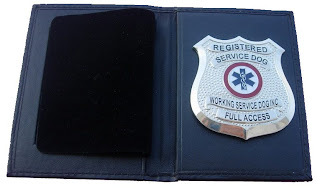 - Leather wallet to professionaly hold the Identification Card and Shield.